Why a camel? It's a workaround due to technical difficulties: We're having upload problems between our digital camera card and Goomp's computer. 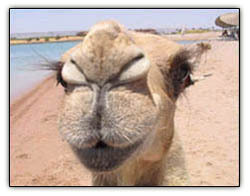 To put a pretty face on a bad situation, we borrowed this beautiful camel closeup from our blogpost of this date last year, March 27, 2004, which was not Easter, of course. We've had to put this post together in stages, as the computer has already frozen up once mid post and could do so again at any time. 'Reminds us of terrorism and Darwinian survival itself. You evolve in response to your enemies' attempts to destroy you. In today's parlance, what doesn't kill you makes you strong. Go here for all you need to know about the dating of Easter. Our heart sickens . . . FOXNews is reporting a new poll says 50% of our fellow citizens "think" John Kerry would do a better job than GW of leading our nation through these dark days. We can't help but think it has something to do with what's wrong with public education. As a nation and as individuals, we were busy with our wonderful lives and left the curriculum to agenda-driven folk with half-baked ideas about what our kids should be taught so they would be spared challenges to their "self-esteem." We've blogged about these issues frequently here. An example: No more valedictorians, as that might make less-accomplished students feel bad about themselves. Forget about the commonsense fact that true accomplishment is the only way to feel good about oneself. You see it in the poverty of vocabulary, the failure to understand grammar, the utter lack of any historical knowledge or perspective. We're talking about the mushy middle, here, the "swing voters" who determine election outcomes. On the left and right are the 30-40% who are paying attention and have a political philosophy upon which their voting decisions are based. The mushy middle just go whichever way the wind blows -- assisted, of course, by a carelessly left-leaning media. One Easter later, we see the American people came through, relegating John Kerry's presidential hopes to the dustbin of history. As for everything else that concerned us last Easter, we're still on the case.